Don Gifford's annotations to Joyce's great modern classic comprise a specialized encyclopedia that will inform any reading of Ulysses. The suggestive potential of minor details was enormously fascinating to Joyce, and the precision of his use of detail is a most important aspect of his literary method. The annotations in this volume illuminate details which are not in the public realm for most of us. The annotations gloss place names, define slang terms, give capsule histories of institutions and political and cultural movements and figures, supply bits of local and Irish legend and lore, explain religious nomenclature and practices, trace literary allusions and references to other cultures. 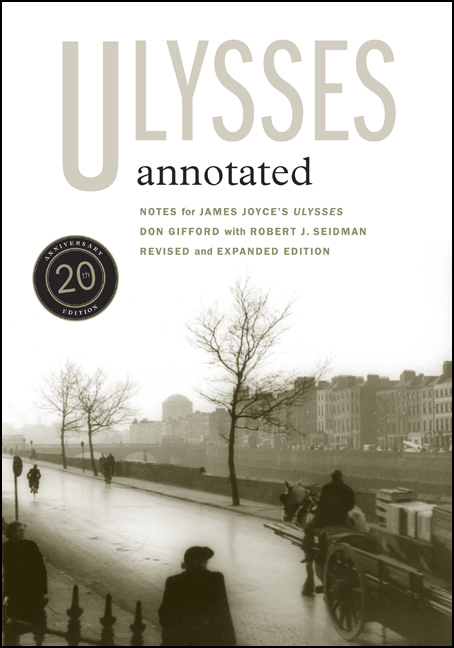 Annotations are keyed not only to the reading text of the critical edition of Ulysses, but to the standard 1961 Random House edition, and the current Modern Library and Vintage texts. Internationally renowned Joyce scholar Don Gifford (1919–2000) was Professor of English and American Studies at Williams College and author of Joyce Annotated: Notes for Dubliners and A Portrait of the Artist as a Young Man and The Farther Shore: A Natural History of Perception.